Ah, White County. A place of beauty, Indian mounds, a Bavarian Village, an iconic Courthouse, and kids grown from cabbage. Thoughts of farmers hard at work, old men drinking coffee on the front porch while the sun rises, and the mountains covered with snow tend to come to mind. But is there more to this seemingly charming place? Perhaps even something sinister? 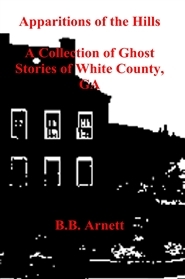 In this book, we’ll dig past the beautiful facades and unearth the secrets found within White County to reveal Apparitions of the Hills. Ah, White County. A beautiful country, complete with a Bavarian village, hills covered in snow, and children grown from cabbage. This community, perhaps the “best kept secret” of Georgia, is one of the last bastions of community families and early morning front porch coffee drinking. You will never find a more understanding or loving people. In fact, this community has been affectionately nicknamed “God’s Country”. 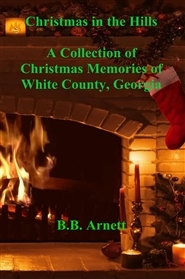 This book contains several memories and traditions of those who have called these North Georgia Hills “home”. From the family of Bryce Buel Arnett and all of us in our amazing Home in the Hills, Merry Christmas to you and your family!